Have yellow backs with large dark brown or black splotches. Their bellies are covered in black and yellow checks. Heads are red or orange in color. The entire body of a snake is covered with scales, including its eyes. Because of this snakes have no eyelids and cannot blink or close their eyes. Fox snakes will emit a musky odor when disturbed. 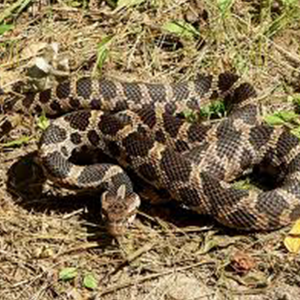 They also coil and vibrate their tails in leaves as to mimic a rattlesnake in order to scare away predators.